Now that Batman V Superman: Dawn of Justice has flown into theaters, we have another superhero romp to focus our attention and anticipation on. Of course, that will be the next addition to the Marvel Cinematic Universe, Captain America: Civil War. While the DCEU is still in its infancy, Marvel has a small army of superheroes to explore in future films. Unfortunately, that small army will be turning on themselves in Civil War, and apparently we may be seeing a casualty or two in the battle. Both of the trailers we’ve seen for Captain America: Civil War include James Rhodes aka War Machine being shot down in the midst of battle and looking to be in poor shape in the arms of Iron Man. This has sparked a debate on whether Rhodey may die in the film, and now actor Don Cheadle has spoken up regarding those rumors. I'm on Twitter, so I've gotten a few people going, 'Rhodey better not be dead, son. I'm going to be so mad.' Or 'I'm done with this thing if Rhodey's dead.’ But that's cool, I like that people get so upset about it. 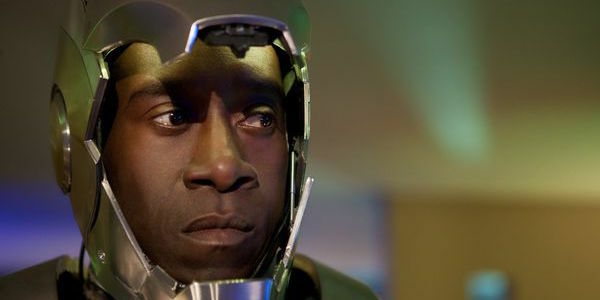 I like that in a Marvel movie people are able to evoke such emotion…It does look bad for Rhodey. This statement was made by Don Cheadle to the Daily News while promoting his new Miles Davis biopic, Miles Ahead. It appears that Cheadle thoroughly enjoys the rumors circulating his character’s possible death, and he may be trying to stoke the fires with his comment about it looking bad for Rhodey. While there will certainly be at least one death in Civil War, I doubt it’ll be Rhodey. Since we’ve seen so much footage of things looking grim for the character, killing him off wouldn’t be much of a surprise. If it were Rhodey going down, the editing team behind the trailers could have included shots of another injury, as to make War Machine’s death a major shocker. Instead, it’s likely that War Machine is just a red herring to the real fatality. Alternatively, his injury could be the catalyst that causes Tony Stark to do something he’ll regret later. After seeing his best friend in poor condition, it seems likely that Stark would use more extreme measures of mechanized weaponry which would result in one or more Avengers meeting their maker. This isn’t to suggest that Tony would kill his teammates on purpose, but rage could win out over logic and create a tragedy. Of course, we’ll just have to sit and wait until we can finally see Captain America: Civil War in theaters. Until then, I’m going to continue watching the above trailer over and over again as if the answers to the plot will somehow reveal itself to me. Captain America: Civil War will fly into theaters May 6, 2016.